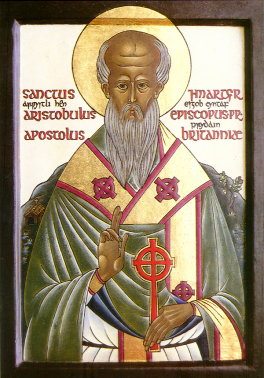 ARISTOBULUS, (First Century), the Holy Apostle Aristobulus of the Seventy, Bishop of Britain is traditionally numbered as one of the Seventy Apostles, and is the Aristobulus mentioned by St. Paul (29th June) in his epistle to the Romans (16:10). According to tradition, St. Aristobulus was consecrated bishop by St. Paul and sent to Britain where he worked to enlighten the pagan population and ultimately met his martyrdom. 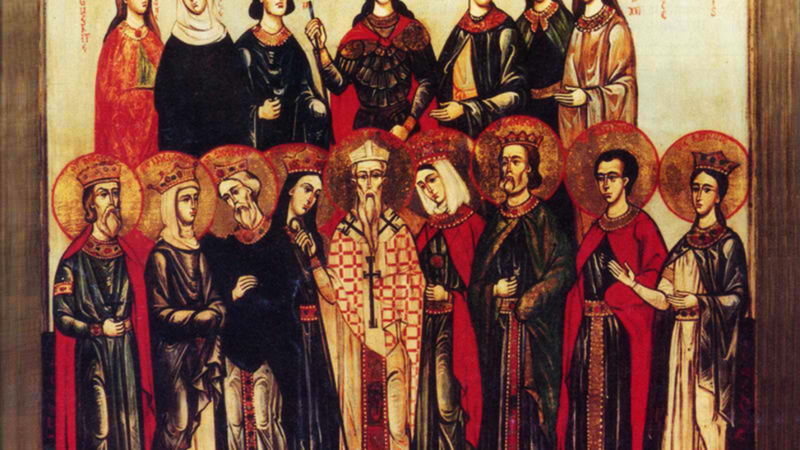 LEOCRITIA (LUCRETIA), raised as a Muslim in a wealthy Moorish family, St. Leocritia converted to Christianity. Upon learning of her conversion, her family banished her from their home. St. Leocritia was sheltered by St. Eulogius (11th March), from whom she also received monastic tonsure. In time they were arrested and convicted, St. Leocritia for apostasy, St. Eulogius for proselytisation. They were then scourged and finally beheaded in 859. They too are numbered amongst the The Martyrs of Córdoba. MANCIUS, a native of Rome who was bought as a slave by Jewish traders and taken to Evora in Portugal, there he was martyred by his new owners. The dates St. Mancius flourished are uncertain, but most likely in the fifth or sixth century. PROBUS, a Bishop of Rieti in Latium (the environs of present-day Rome). St. Gregory the Dialogist (3rd September) testifies to St. Probus’ sanctity in the fourth book of his Dialogues . St. Probus reposed circa 571. SPECIOSUS, a wealthy landowner from Campania (southern present-day Italy) who renounced the world and joined the Abbey of Monte Cassino with his brother Gregory. There both brothers received monastic tonsure from St. Benedict (21st March). St. Specious was later sent to the new foundation at Terracina. St. Specious reposed in Capua in Campania circa 555 whilst undertaking abbey business there. ZACHARIAS (ZACHARY), 91st Pope of Rome from 741 until his repose in 752. He was born in San Severino in Calabria, his family was of Greek heritage. St. Zacharias was particularly concerned with the restoration of the churches of Rome, and restored the Lateran palace using much of his personal wealth. He also translated to the Church of St. George in the Velabro neighbourhood of Rome, the head of the Great-martyr, Victory-bearer and Wonderworker George, which had been discovered at the Lateran Palace during restoration. St. Zacharias translated the Dialogues of St. Gregory the Dialogist (3rd September) into Greek as well, which proved to be quite popular in the Eastern parts of the Roman Empire.